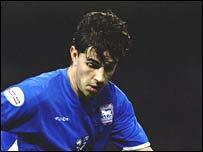 Striker Pablo Counago has returned to Ipswich Town on a free transfer after two years at Spanish side Malaga. Counago joins on a two-year deal with an extension to a third year if the club are promoted to the Premiership during the duration of his contract. The 27-year-old forward hit 31 goals in 99 appearances during his previous four-year stint at the club. Chairman David Sheepshanks told the club's website: "We are delighted to welcome Pablo back here."